Twist therapy is like Whirl in sea Thunder in your body it chages every thing. Every persons minds always asking question : where lies the origin of this world, exactly the point from which all varieties of things has come in to being? How did it appear and why? Is there any way to know about the very first phase of whatever existence? When it comes to such fundamental questions the human intelligence has always tackled with persistence, which like a guiding light inspired the greatest scientists and philosophers throughout the history of mankind, we have nothing but philosophical speculations without any possibility of objective verification to prove, just as in anything that concerns the events of the far remote past, the early dawn of existence, the first phase of beginning of our universe. This subject regarding the origin of existence has been dealt with and mentioned repeatedly by historically prominent scholars, philosophers and scientists. Owing to these facts, some generally accepted principles have already been established on this subject matter, being firmly built into our knowledge system as one of the basic concepts and influence greatly the entire process of cognition. 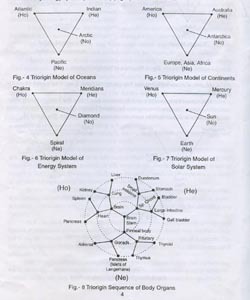 The Triorigin theory gives us the possibility to deal with this subtle subject on the basis of logical sense which itself is deeply rooted in the very remote past, and the accumulated fund of essential knowledge up to date. The concept of Triorigin is but a regular out come from the well known theoretical ideas and philosophical concepts already existing in the past and present, evolving as a result of their consistence elaboration. Triorigin is the three fundamental forces- Hetero, Homo and Neutro- that have created the existing world and are guiding its evolution. Prof. Park has introduced the Homo and Hetero and its concepts in his various books and two articles, Eight origins theory (1) and (2) in Onnuri Medicine magazines vol- 1 & 2 -1999; in which he has briefly touched upon the concept of Neutro. The Triorigins constituents- Homo, Hetero and Neutro origins have their own influential forces which are responsible for different kinds of phenomena and existences found in this world. Through observations and comparing the objects and phenomena, we shall come to understand who each of these forces act upon various forms of existence. On the basis of above knowledge we shall now study in brief about (i) Twist Therapy (ii) Smile Therapy. All units of existence should not follow the Triorigin model order as explained in previous pages. If not they are not allowed to exit in this world. 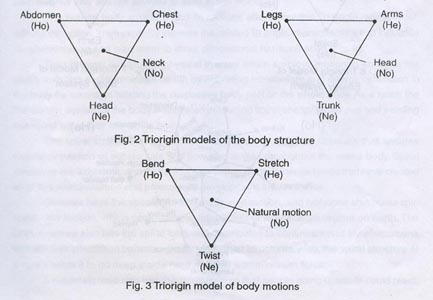 The human body structure and its motion also follow this Triorigin model order without exception. They explicitly express the related Triorigin characteristics that influence life phenomena and lead them to three-dimensional harmonization (Fig.3). Twist Therapy is a kind of physical therapy, which employs motion to enhance the bodily activities and to maintain health by activating metabolism and energy circulation in the body by means of twisting the respective body part or the whole body. 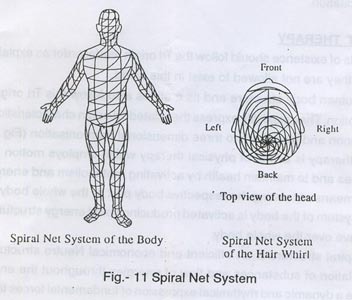 As a result the Neutro Net System of the body is activated producing spiral energy structures and sending this spiral wave over the whole body. The spiral structure is an efficient and economical Neutro structure that ensures natural circulation of substances and flow of energies throughout the entire body. Spiral structures are a dynamic and rhythmical expression of fundamental forces that have created all of this world-cosmos and promote its development and evolution. Galaxies have the spiral form and make spin motion, and typhoons also make spin spiral – like motion, which contributes to adjustments of temperature regime of earth. The DNA structure also has the spiral form and contributes to continuation of life phenomena with efficient interaction between genes with their structures. Also, the spiral structure of a screw helps it to go deep inside hard material with minimum force. In the human body, many layers of the Neutro Net System are formed the moment of birth, when the original spiral net system is planted through the abdomen starting from the navel. The most evident example of this spiral system is the vertex of the head. The spiral net system is composed of three energy lines: vertical (Hetero), horizontal round line (Homo), and diagonal line (Neutro). 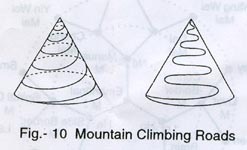 This diagonal line has the spiral the form and plays the leading role in the spiral net system (Fig.11). Through the spiral net system substances and energies necessary for life phenomena are distributed all over the whole body and keep circulating to maintain health. When the body is being twisted, this Neutro Net System gets activated and those life substances and energies, which are in the stagnated condition, start to move and finally bring about recovery of vital life activities. That is why twist therapy has such surprising treatment effectiveness. Straight movement represented by a line is Hetero movement, the circulation on the same place of a plane (round movement) is Homo since it goes without any changes, and if the straight Hetero movement and the round Homo movement are combined, the spiral Neutro movement is created. 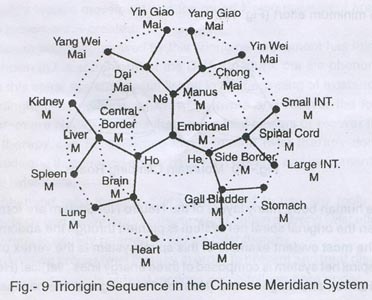 The human body harmonized by this Trioriginal movement has this spiral network system. As shown in the spiral form of the DNA structure, our life phenomena could get started when this spiral system is established in the beginning of existence. Accordingly, twist motions, which will activate and recover the formation of this spiral net system are Neutro motions that create vital powers or recover them. Twist therapy can be classified into common twist therapy done without any instrumental aids and thus termed empty hand twist therapy, and instrumental twist therapy, such as towel twist therapy. In empty-hand therapy, there is no need to use any tolls for therapeutic purposes, anybody cam easily use this therapy and obtain a strong twist effect. The empty-hand twist therapy is usually referred to just as twist therapy. For performing proper twist therapy in order to prevent and treat disease we should learn properly basic concepts of twist motions, which follows here under. There are basic twist motions that should be understood to be helpful for the purpose of twist therapy. They are: in-twist and out-twist, bend twist and straight twist, contraction twist and expansion twist, as also fixed twist – moving twist and natural twist. The central nervous system is represented by the brain and spinal chord, and is located along the central line of the body, having the vital function to connect and control all parts of the body and internal organs. Whenever the cells of the C.N.S penetrate, all the time, the blood vessels follow them to assist their normal function by supplying nutrition and oxygen. If there is some functional obstacle in the nervous and circulatory systems, the body reacts immediately, developing symptoms of a disease, or pain. Twist motions can create the Neutro – characteristics spiral network even in the nervous and circulatory systems, increasing and improving their function and activating vital processes in the body for their normalization. Understanding the relationship between the internal organs and body parts maintained by the C.N.S. is helpful to treat disorders by twist motions whenever an organ or body part is affected. If we know, which spinal segment is responsible for innervations of the affected body part, we can use a twist motion acting on the related region of the spinal chord. (1) Joyful Twist Walking, (2) Onnuri Twist Therapy, (3) Onnuri Towel Twist. Twist therapy is method of safe and easy body twist motions and postures that provides treatment effectiveness for disease as well as prophylaxis of well-being. A powerful harmonizing effect of twist motions and postures is ensured by the fact that they activate meridians of the spiral net energy system filling them in with Neutro energy. One simple twist motion of the neck (neck twist) arrests a headache. The neck and trunk twist allow to decrease high blood pressure. After a single spiral twist of the chest heart pains disappear. Even emotional disorders, feelings of anxiety, sadness and other stressful states yield to treatment by twist motions. Based on fundamental Triorigin Model order it enables to use relevant twist motion in each particular case. This method is ease to learn and use for self recovering from illness and resisting disease as well in an emergency cases. Twist therapy is free for everybody as there is no need to use any special equipment or tools except one's good will and intention to stay well, healthy and happy through the whole life. The Hetero force appears out of Neutro – the zero world. Getting tired of the immutability of the latter, the one-dimensional Hetero existence is the first to appear in this world, breaking through its tranquility and silence. Manifestation of Hetero force are straight, it acts freely and quickly, without hesitation. Accordingly, Hetero tends to change existence, to create difference. All differences between the units of existence result from the influence of the Hetero force. Trying to change all and everything, the Hetero force creates such phenomena with Hetero characteristics as expansion, dispersion, separation, proliferations, high temperature, accelerating motion. If the Triorigin forces are not well harmonized in some existence, the prevalence of the Hetero force would bring about the state of disorder, gradually turning into dissemination and removal of it from this world. The Homo force appears after the Hetero force, and Represents the next stage of evolution-creation of two-dimensional existence. The Homo force establishes the symmetrical relations with the Hetero force, restricting its influence in this world. Accordingly, Homo tendencies are in the direct opposition to Hetero manifestations: contraction, unification, simplification, preservation and return to the starting point of development. The Homo force tries, as far as possible to return all being(s) to the original state-unchangeable life in the zero world. Due to the action of the Homo force the similarity of objects and phenomena is preserved. This is beneficial when it is necessary to keep existence in certain order. A human being gives birth to a baby, a small fish appears out of a fish egg – this happens due to the influence of the Homo force. Homo is conservative, it allows of no change. Thus, it creates such phenomena as compression, solidity, coldness, flattening, deceleration, pressure, attraction, gravity. If in some existence the Triorigin are not well balanced – well harmonized the Homo force, making no discrimination, destroys it and return it to the zero world. The Neutro force means real three-dimensional existence, recreated through the unification of Hetero and Homo with the participation of the Neutro force as a mediator. Hetero and Homo forces acquire their real meaning for existence, once the Neutro force appears in this world following Hetero and Homo forces. These forces together form the Triorigin, which controls the Triorigin real world. The existence spirit of Neuto which implements the creation of existing Triorigin, first sends Hetero and forces to this world for the Neutro reality to appear. The Neutro force is the result of their (Hetero and Homo) unification, so it possesses combined Neuto and Hetero, and Homo characteristics, have their own individual properties as well. Owing to this diversity, the Neutro force is capable of leading this real world, sometimes manifesting Neuto, Hetero and Homo properties and sometimes harmonizing and regulating them. While Hetero and Homo are unilateral, Neutro can be bilateral and even multilateral at times to realize spirit of existence in this world. Accordingly, Neutro is equipped with all characteristics of Neuto, Hetero and Homo, and the Neutro force knows who to use them in the most effective and harmonious way. Neutro takes care that the process of existence in the real world should not loose its meaning. To this effect, Neutro guides it along the path of gradual development and leads to achieve the perfection of the world of infinite Neuto. Neutro has the characteristics and properties of connection, harmonization, spontaneity, co-ordination, neutralization, equalization, equity, systemization, order, activation, continuation, effectiveness, rhythm improvement, adaptability, reconciliation and morality. As far as Neuto is concerned, it is the original force that creates Hetero, Homo and Neutro. It possesses unlimited potentialities of zero world. And this force does not make an artificial involvement in the world, displaying the qualities of naturality. The Hetero ,Homo and Neutro forces come into being in this world owing to the existing spirit of Neuto. This Triorigin creation process starting from Neuto-Hetero–Homo-Neutro becomes the underlying principles of existence and remains the basic framework guiding all beings-entities – along this way. This fundamental principle of order is termed Triorigin Model.